Banksia coccinea plants are killed by fire and regenerates afterwards from seed released from burnt follicles. 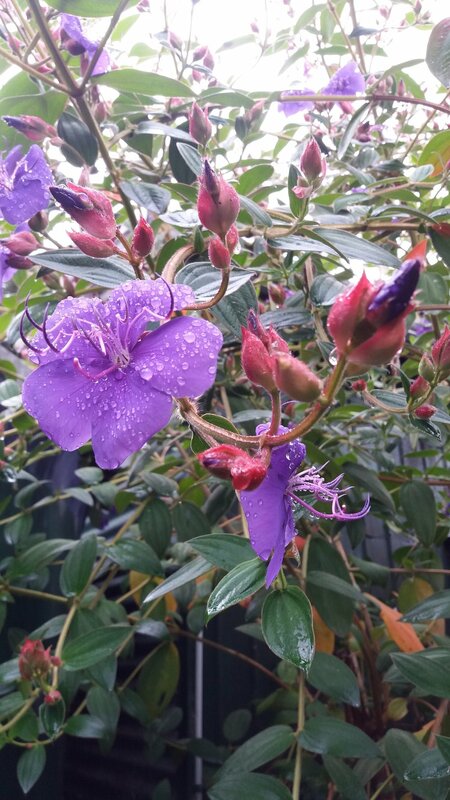 The flowers attract nectar- and insect-feeding birds, particularly honeyeaters, and a variety of insects. Widely considered one of the most attractive Banksia species, B. coccinea is a popular garden plant and one of the most important Banksia species for the cut flower industry; it is grown commercially in several countries including Australia, South Africa, Canada, the United States, New Zealand and Israel. In cultivation, B. coccinea grows well in a sunny location on well-drained soil, but it cannot survive in areas with humid or wet summers. Mount Manypeaks is a distinctive peak located approximately 35 kilometres (22 mi) north-east of Albany, Western Australia, 10 kilometres (6 mi) north-east of Two Peoples Bay and 6 km south-east of the town of Manypeaks. 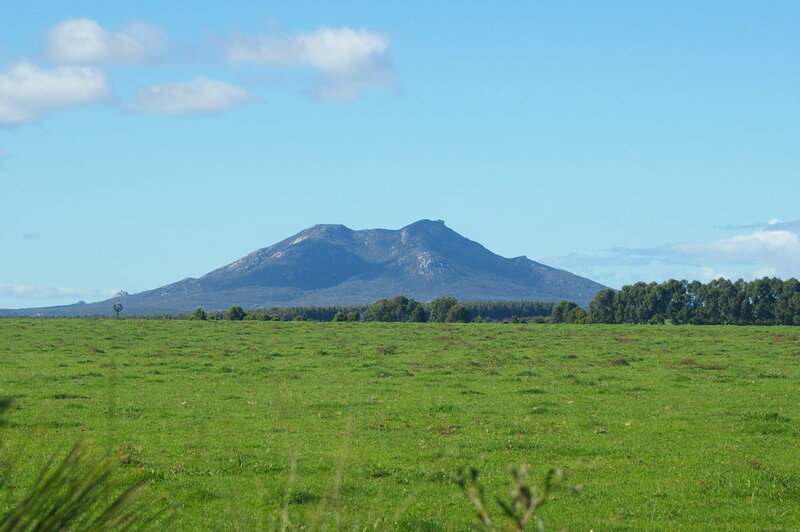 The mountain is the dominant feature in the area and was named by Captain Matthew Flinders in January 1802 whilst surveying the south coast region in the "Investigator". Flinders noted in his journal "There are a number of small peaks upon the top of this ridge, which induced me to give it the name Mount Manypeak". The plural form has now become the accepted form of spelling. The Mount Manypeaks formation has a total length of 22 kilometres (14 mi) and has a width of 3 kilometres (2 mi). The ridge is made up primarily of a type of granite, proterozoic porphyritic biotite granite as well as adamellite. In places limestone lies over the granite block. The Mount Manypeaks Nature Reserve forms part of the Two Peoples Bay and Mount Manypeaks Important Bird Area, identified as such by BirdLife International because of its significance in the conservation of several rare and threatened bird species. Farming in the northern part of the Manypeaks landscape is mixed cropping (mainly canola, wheat and barley) and sheep production with a change to cattle farming the higher rainfall areas to the south, where extensive areas of blue gum plantations have been established and there are small pockets of intensive horticulture. Threats that affect the biodiversity of the Manypeaks landscape are many and include altered hydrology, various dieback diseases, introduced predators, inappropriate fire regimes, human recreation, historical and current clearing causing habitat fragmentation, weeds and grazing. The Waifs formed in August 1992 in as a folk rock band. The Simpson sisters, Donna and Vikki grew up in Cosy Corner in Albany in a Salmon fishing family. They formed a duo, Colours, in Albany to perform cover versions of Bob Dylan and Everly Brothers at local pubs. Their father, Jimmy Simpson, bought Donna her first guitar when she was 15. In February 1992, 20-year-old Donna and her 16-year-old sister, Vikki headed off in a Kombi van to tour the state as Colours, busking their way across Australia.. Upon their return to Albany, Colours changed its name to The Waifs (initially styled as The WAiFS) and continued to use their Kombi van from 1992 to 1996 to travel to gigs across Australia. 2017 marks The Waifs 25th Anniversary. They are commemorating this event by releasing a new album called IRONBARK. The inspiration came from the majestic eucalyptus standing sentinel over them as they recorded 25 songs live & acoustic at Josh’s beautiful house in the bushland of South Coast NSW, Australiaand the resilience and inner strength of the wood as orated in the song of the same title. Thurlby is a delightful place to visit. They maintain a philosophy of ethical, environmental and family friendly values. 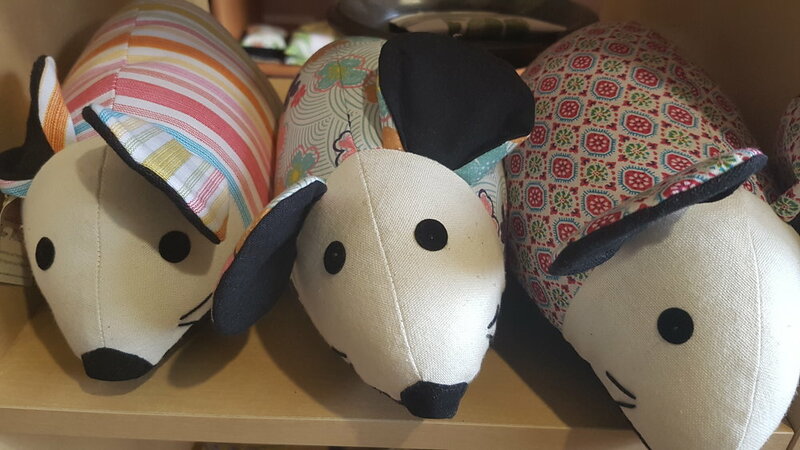 The Thurlby Herb Farm Gift Shop is a colourful and unusual haven of stylish gifts, including Thurlby handmade soaps and natural aromatherapy products. Changing with the seasons, the menu reflects a passion for healthy, delicious food at reasonable prices. We enjoyed a gourmet vegan burger - Sweet Potato & Pumpkin Burger – Thurlby's famous homemade burger with basil and pine nuts served in Turkish bread with salad and Thurlby Chutney. We were pretty excited to find vegan food at this out of the way spot, only 1km from our Wilderness Retreat. Of course we had to bring home some chutney and do some early Christmas Shopping. Conspicuous Beach is a beautiful unspoilt surf beach 20 minutes drive from Walpole on the south coast of Western Australia. It's one of only 3 places along the Walpole Coast that's accessible to 2WD vehicles. Access to Conspicuous Cliff Beach is via a boardwalk, small stairway, and a walk across the shallow waterway emptying into the ocean. Great excuse to take of the shoes and walk barefooted through the sand and breathe in the ocean air. This is what holidays on the South Coast are all about. We had the whole beach to ourselves, surrounded by beauty and breathtaking views, A beautiful way to spend the last couple of hours of our last day. 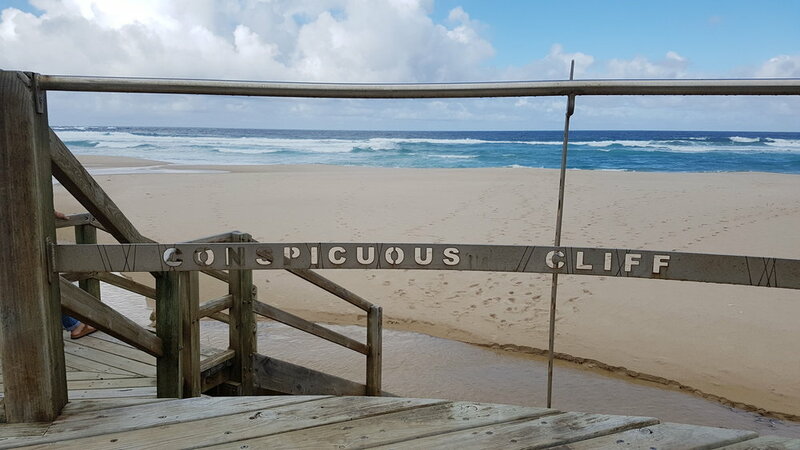 If you are travelling to albany via Walpole it is worth taking a small detour to visit Conspicious Cliffs and Beach. The beach is named for the small, yet indeed quite conspicuous, limestone cliff perched atop a tall, steep hill that towers over the beach. Then we saw more stairs and just couldn't resist climbing to the very top. The views were quite spectacular and the wind almost blew us away. We love walking through the bush and chose our accommodation in the middle of the ancient Tingle Forrest. The walks through these Tingle Trees was a unique experience. We felt so little in amongst those giant trees. The Red Tingle (Eucalyptus jacksonii) of south west Western Australia is one of the tallest trees found in the state. The common name, “tingle”, is believed to be derived from a Noongar word for these trees. 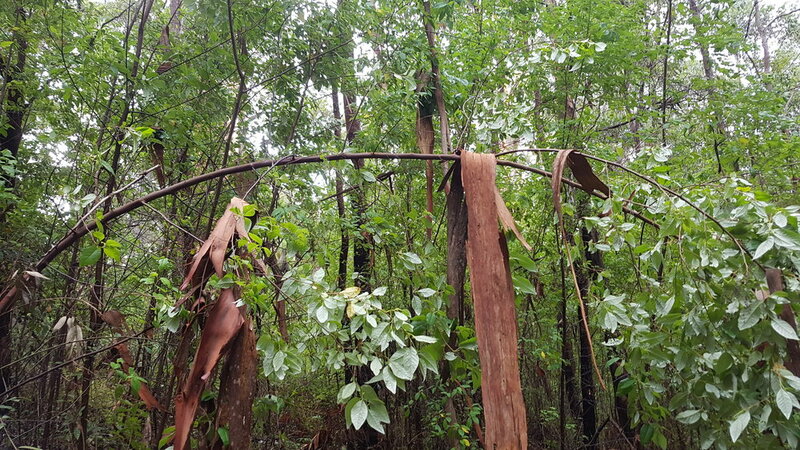 The Red Tingle is the tallest of the three trees ( Rate's Tingle Eucalyptus brevistylis and Yellow tingle Eucalyptus guilfoylei are the other two) typically growing to a height of 8 to 55 metres (26 to 180 ft) and has rough, stringy and furrowed grey-brown or red-brown bark. It can have a circumference up to 24 metres (79 ft) round at the base and grow to a height of 75 m (246 ft). The tree can live for up to 400 years. It has a dense compact crown that forms a heavy canopy. The tree flowers between January and March producing a white blossom. The trees often have shallow root systems and grow a buttressed base. Forest fires often act to hollow out the base of the trees creating a large cavity. The distribution of the species has been shrinking due to climate change over the years. They are now found primarily in Walpole-Nornalup National Park and in a few isolated sites outside the park in the Walpole area at the juncture of the South West and Great Southern regions along the south coast of Western Australia where it grows on hillsides and in gullies in loamy soils. We recently had a few free days, after a very busy end to last year and a busy start to 2017. We packed the car and headed to the Walpole Wilderness. Mount Frankland National Park is a national park in the Walpole Wilderness, in the South West region of Western Australia, 327 km south of Perth. Dominated by an impressive granite peak, Mount Frankland National Park covers approximately 31000 hectares of karri, jarrah and tingle forest as well as expanses of treeless heathland. 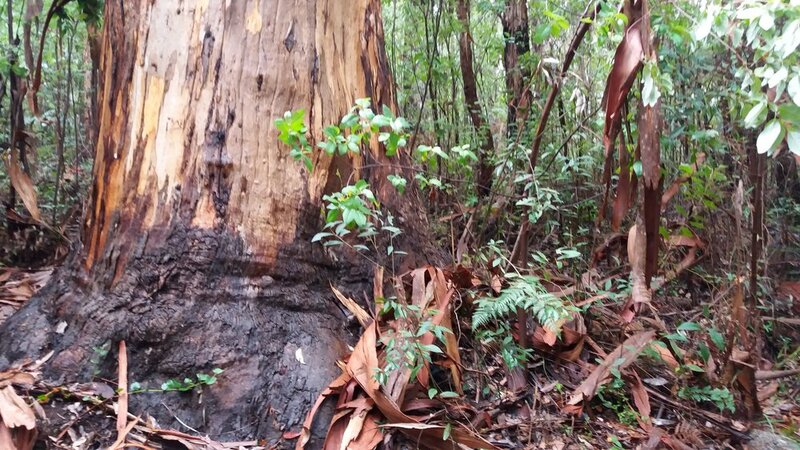 It covers the low granite hills to the north of the town of Walpole and is covered largely by forests of karri (Eucalyptus diversicolor) and red tingle (Eucalyptus jacksonii), two of the world's largest trees. The three tingle species are unique to the area between the park and the coast and the only eucalypts to be buttressed, a feature which reflects the moist conditions prevailing within the park. On exposed areas where continuous rain washes away soil, a low heathland is the dominant vegetation. From the top of Mount Frankland you have 360 degree views of the Walpole Wilderness. The forests, wetlands and heathlands below you are home many unique plants and animals. Mount Frankland National Park is home to a rich array of birds, from eagles that soar high above the peak to colourful fairy wrens and robins that flit through the forest. We followed “The Summit trail” to the towerman’s lookout on top of Mount Frankland. While the walk was strenuous, the views made it worthwhile – on a clear day you can see the Porongurup and Stirling ranges in the east and the Southern Ocean to the south. It was pretty cloudy when we were at the top but still worth the climb. 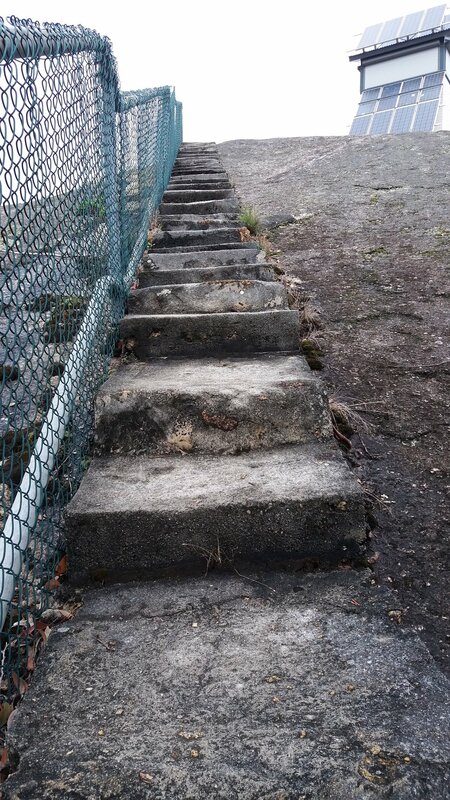 To get there we needed to climb a ladder and over 300 steep steps. That was a challenge for Maggie as she has a fear of heights, but bravo!! She did it. The Shy Albatross is the largest of the black-backed albatrosses, with a wingspan of 2.12 - 2.56 m. They have a distinctive underwing pattern; mostly white, with very narrow black margins and a diagnostic black notch at the top of the wing, just next to the body. The forehead and crown are white, forming a pronounced white cap sharply bordered by a narrow greyish-black brow and light greywash across the sides of the head (including nape, ear-coverts, cheeks and sides of throat in most individuals) (Marchant & Higgins 1990). The lower mantle and back are blackish with a pronounced silvery bloom that contrasts with the darker, uniform blackish scapulars and upperwings. The rump and upper tail-coverts are white, while the tail is a light grey, turning darker brown with wear. The bill is a uniform greyish-horn colour, merging to straw-yellow by the mid-section, with a yellow tip. The iris is dark brown, and the legs and feet are bluish-flesh (Marchant & Higgins 1990). The Shy Albatross is the only albatross species endemic to Australia and have been found as far west as Albany. Off the coast of Tasmania, Australia, lies a small island on which 10,000 rare shy albatross live. Their declining population is a concern for conservationists. Albatross Island is home to 5,000 breeding pairs of shy albatross and is one of only three islands in the world on which the species lives. You can see the Shy Albatross from the look outs at The Gap and Natural Bridge. HideAway Haven is a luxury 5 star, multi award winning hosted accommodation in Albany, on the Amazing South Coast of Western Australia. We love creating memories for our guests. We encourage them to collect moments not things as they travel through our beautiful region. Our passion is environmental sustainability and the care of our precious flora and fauna, through education and research and sharing this with our guests. We have over 48 varieties of birds that call HideAway Haven home. Gilbert's Potoroo, sometimes called the "rat-kangaroo" is a small marsupial teetering on the brink of extinction. 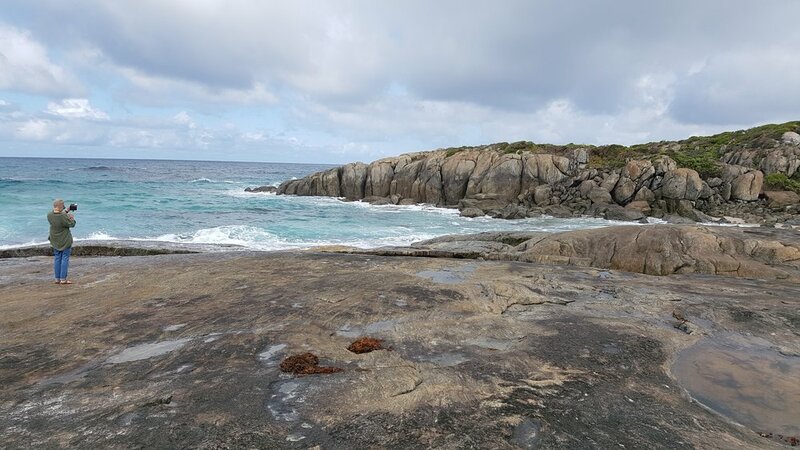 Found naturally only in dense scrub on a rugged, windswept headland thrusting out into the Southern Ocean at Mount Gardner headland, Two Peoples Bay Nature Reserve, just 20 minutes from HideAway Haven, in Amazing Albany on the South Coast of Western Australia. Within that small area (1000 ha), it occurs in at least four separate patches of long-unburnt, dense shrubland on the valley slopes It is estimated there are only 30 to 40 animals in the only known wild population. The greatest threat to its continued existence is wildfire. Gilbert Potoroo's are a medium-sized mammal slightly smaller than a rabbit and bearing some resemblance to a bandicoot, Gilbert's Potoroo has a dense coat of soft grey-brown fur. Adults range from 900 g to 1200 g. Gilbert’s Potoroo feeds mainly on underground fungi. Female Gilbert's Potoroos can produce young at any time of year. Young are born 4-6 weeks after mating and are approximately 1 cm long at that stage. They spend three to four months in the pouch before coming out for the first time at around 150g body weight. Within a week, at around 190g, they have permanently left the pouch, although for around a month they will still suckle from the mother. Young potoroos begin to eat solid food as soon as they leave the pouch and over the next few months they gain, on average, 6g/day. They remain in their mother's home range for another month or two but at about six months of age, when their weight reaches 500-600g, they will leave. (source: Potoroo.org) Hand-rearing of large pouch young is successful, but it is very labour-intensive. What can you do to help with conservation? Learn more about endangered species and spread the word to family, friends and colleagues. Our More Information page is a good starting point for further research and includes links to other relevant sites and a list of further reading. These organisations can also often offer volunteers opportunities for hands-on involvement in conservation work. HideAway Haven is a luxury 5 star, multi award winning hosted accommodation in Albany, on the Amazing South Coast of Western Australia. We love creating memories for our guests. Our passion is sustainability and the care of our precious wildlife. The Southwest of Australia Hotspot occupies some 356,717 km and our Amazing South Coast Region is part of this hotspot. This hotspot is one of five Mediterranean-type ecosystems in the world, most rain falls during the winter months and the summers are characteristically dry. Honey Possums eat nectar from flowers. Photo Jiri Lochman/Lochman Transparencies. Our South Coast Region makes up part of Australia's only biodiversity hotspot - and is just one of 35 biodiversity hotspots around the world. Almost 80 percent of the plant species in our region are found no where else on earth. The diverse range of wild flowers, forests and native animals found in our Amazing South Coast all contribute to the rare and unique nature of the region. It must have at least 1,500 vascular plants as endemics — which is to say, it must have a high percentage of plant life found nowhere else on the planet. A hotspot, in other words, is irreplaceable. It must have 30% or less of its original natural vegetation. In other words, it must be threatened. Around the world, 35 areas qualify as hotspots. They represent just 2.3% of Earth’s land surface,but they support more than half of the world’s plant species as endemics — i.e., species found no place else — and nearly 43% of bird, mammal, reptile and amphibian species as endemics. Southwest Australia is one of 25 original global hotspots for wildlife and plants, and the first one identified in Australia. Since the first analysis identifying biodiversity hotspots in 2000, the list has expanded, and now 35 hotspots are recognised, two in Australia: the Southwest and the forests of east Australia. Biodiversity hotspots are defined as regions “where exceptional concentrations of endemic species are undergoing exceptional loss of habitat”. As many as 44% of all species of native plants and 35% of all species in four animal groups are confined to the original 25 hotspots, which comprise only 1.4% of Earth’s land surface. This opens the way for a conservation strategy, focusing on these hotspots in proportion to their share of the world’s species at risk. According to Conservation International’s assessment, southwestern Australia is one of the biodiversity hotspots with the most opportunities to save species and habitats because of our relatively low population pressures. So it makes perfect sense to concentrate a large conservation effort here to protect those habitats and restore what we can of the losses. There are places on Earth that are both biologically rich — and deeply threatened. For our own sake, we must work to protect them. I love my early morning walks down to the beach and watching the sun climb out of the ocean as I welcome another amazing day in the Albany Region. But a sunrise in the middle of the bush is just another magical start to the day. Away from the noise of traffic, people, dogs I love welcoming a brand new day with the chirping birds, calls of the wild and the breeze rustling through the leaves. I love listening to the magpies as they chatter to each other, the little birds singing in the trees, the kangaroos grazing in the distance and other Aussie Critters rustling through the undergrowth. HideAway Haven 5 star hosted luxury accommodation in Albany on the South Coast of Western Australia. Bed and Breakfast with a comfortable bed and gourmet breakfast. Whether you are interested in simply relaxing by the warm, turquoise blue waters of the ocean, while soaking up the sun, doing business in the area, taking a bush walk, a mountain hike or exploring the region, HideAway Haven will offer you a unique and memorable stay. Albany Region with its seven National Parks, surrounded by the natural beauty of 49 pristine beaches, spectacular granite coastline, extraordinary diving opportunities, two rivers, two harbours, being the oldest settlement in WA, ancient mountains, temperate rainforest and the spectacular Sky Walk in the middle of it and whale watching for four months of the year, there is something for everyone. I love my early morning walks to the beach (only 2.9km), a short stroll along the beach, listening to and watching the waves as the sun comes up and then returning home via some bush tracks enjoying the wild flowers, birds and wildlife. I especially love looking at how busy the spiders have been during the night and seeing all their awesome webs. I am so careful not to disturb any of them as it must have taken all night to build. It really is the perfect way to start every day. You can experience the same while staying with us at HideAway Haven. Every morning you have two choices; continue to sleep with your dreams, or wake up and chase them. The stillness of the early morning scene enables me to take in and enjoy many things which pass me by during the bustle of the day. It is so peaceful at this time of the day! With the kiss of ocean mist dancing on morning waves lapping against a sandy shore, this is perfect time to stand still and and breathe in the salt air. I love my morning walks along the beach especially in Autumn. The morning temperature is brisk aka freezing but once the sun rises it is warm and I could walk forever. The beach is a short 3km walk from HideAway Haven or a 5 min drive. Why not enjoy the sunrise over the ocean and return for your gourmet breakfast and coffee on your deck. Street art is evolving into new and exciting areas of creativity. Find out what the world's leading street artists have come up with in the Albany Region, by taking a walk down York Street. We did and were impressed by the talent and creativity of these street artists. Wall art has brightened up the blank façade of many buildings and improved the feelings of the lane-ways. The artwork celebrates the local area, the ambience and energy of Albany. We enjoyed how the artists interpreted Albany people and surroundings, our harbour and the ocean, with the outlying islands. 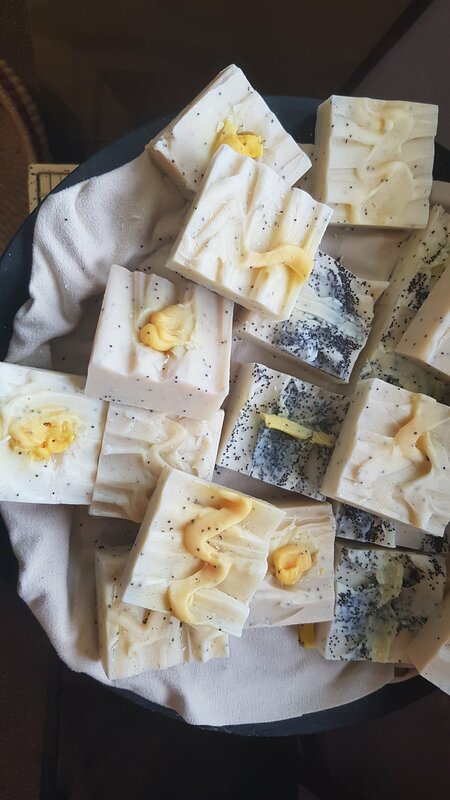 They have captured the unique, breathe-it-deep freshness and wildness that has always been a part of the Albany Region. there is the story of the earth. John will take you closer to the awesome coastline of Albany than any other boat trip and at an exciting and exhilarating pace with his Wave Rider. 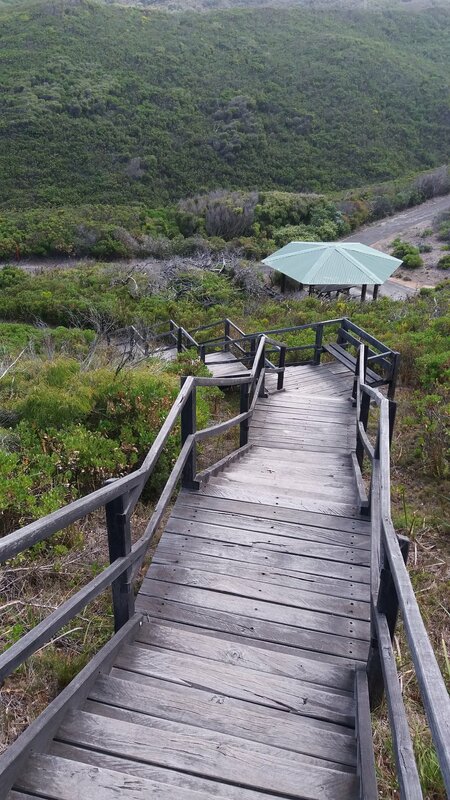 Leaving Discovery Bay John will take you on a adventure around Bald Head towards the new viewing platform at The Gap. On your return John will take you to see Limestone Head, Bald Head, Isthmus, Salmon Holes, Peak Head, Jimmy Newells Harbour, Cable Beach and much more. John is working on plans to make this a regular trip. I love seeing the open ocean stretching forth endlessly into the distance and riding the waves on that open ocean was just awesome. Thank you Skyprints for your awesome photo and video footage. The mornings are cool and crisp with mist settling into the valleys. Watch the sun rise and mist lift as you sit on your deck, wrapped up in your cosy white gown with a warm cuppa in warming your hands. With a huge variety of beautiful natural scenery and so many things to do and experience, Albany Region is a destination to discover and experience in autumn. Albany’s mild and mostly-sunny autumn weather is absolutely perfect for enjoying the outdoors on a picnic or a long hike in one of our many National Parks. See our Walks and Hike guide. 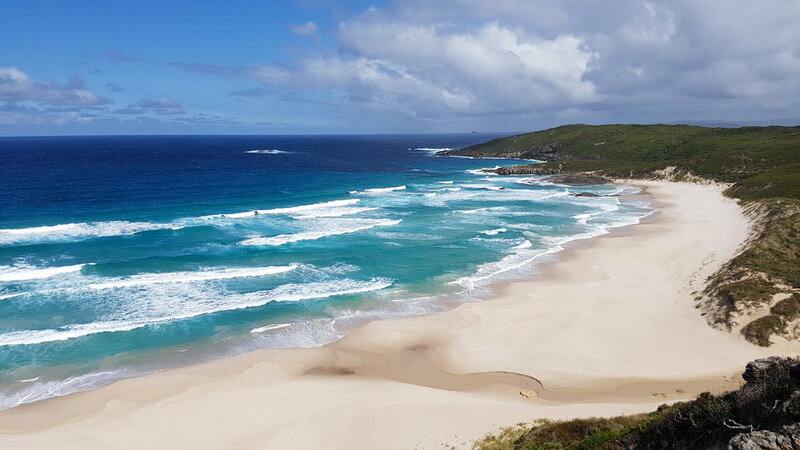 Some days the weather is warm enough to spend the day at the beach and enjoy a swim in the crystal blue waters of the Southern Ocean. 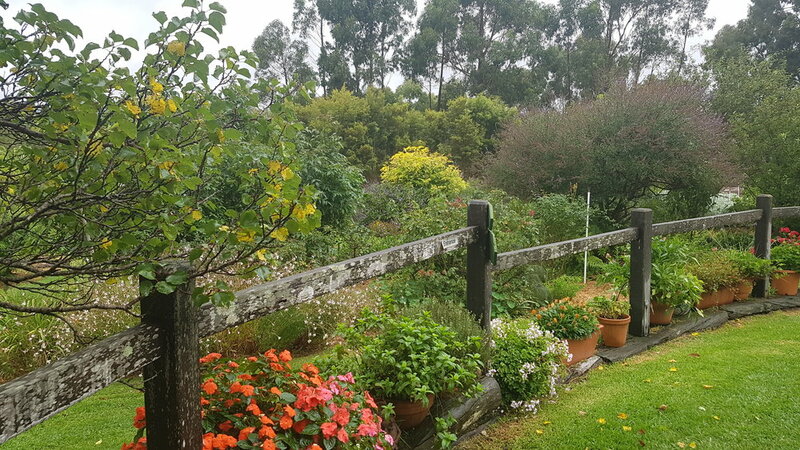 And to mix it up a little there will be some cool and rainy days to entice you to go for a scenic drive, wine tasting or maybe a long winery lunch at one of the many wineries in our region. "Make the change from visiting to discovering and experiencing the Albany Region"
There is nothing monotonous or boring about our Albany weather, and it's because of its diversity that we have such wonderful landscapes and countryside. While most of Australia will be experiencing record temperatures with no end in sight, we will be “enjoying” another cool summer. The relentless blue skies and hot burning sun became very exhausting. In Albany even on a warm day our sea breeze kicks in early afternoon to bring refreshing relief from the heat. No need for air conditioning, just open up the windows. We think "cold" is when the white flakes come down, and we don't experience winters like that in Albany, unless you are on top of Bluff Knoll. Albany winters are quite mild and you can often find a sunny spot on a beach somewhere that is sheltered from wind to enjoy hours of real warmth. Most days are very comfortable, but it's important to be prepared for both cold and warm weather. Pack wisely, dress in layers and you will be able to enjoy Albany whatever the weather conditions. Where is the one place where you can just stop and breathe? The one place the mere sight brings a sense of relief? The one place where the sound brings waves of relaxation? With the pure white sands and turquoise waters, Albany truly boosts countless pristine beaches. There will always be a beach where you can walk on, to contemplate life or let go of stress, where there will be no one disturbing the peace that you are seeking. Early morning walks along the beach, whilst watching the sunrise, is a peaceful way to start the day or late afternoon picnics on the beach watching as the sun slips below the watery horizon is a perfect way to end a day. What a perfect way to spend time. Have you been working too hard lately? Stress levels through the roof? Do your energy levels need a serious boost? It sounds like it is time for you to take action and put your well-being, health and happiness top of your priority list. Booking and planning a holiday, even if it is still months away, will give you something to look forward to and you will be surprised at how good it makes you feel now. Our time is limited and as such very precious and our holiday time even more so. For many busy working professionals it is important to book a holiday that can tick lots of boxes – an ultimate combination holiday, complete with experiences, discoveries and achievements. Being able to explore a destination that you have always wanted to go to is a wonderful way to reinvigorate yourself to the wonders of the world and its people. Of course you will need some time to rest and have relax in order to recharge those exhausted batteries. Add in some feel good factor for your body and soul –yoga is great for your body as well as your mind and soul. Why not book yourself an Rest and Relax Long Weekend at HideAway Haven. Try Sup Yoga at one of our many stunning beaches, or Flying High Yoga on your deck, indulge in a massage and end the day with a RAW Food cooking class. During your stay why not try one of the many Experiences or Discoveries that our Albany Region has to offer, from Sailing to Abseiling, walking or cycling or just discover some of Albany's rich history, ocean wilderness, food or wine. The Munda Biddi Trail is a world-class, nature-based, off-road cycling experience. A unique trail where a 1000km track has been built through an undeveloped natural corridor from Mundaring to Albany. The Munda Biddi Trail means path through the forest in the Nyoongar Aboriginal language. Enjoy a meandering pace with plenty of opportunities to stop and look at the cattle, goats, horses and other farm animals along the trail. In the quiet of the trail keep your eyes and ears alert for the many different of bird calls from the native birds, enjoy watching small animals such as bandicoots and rabbits running across or beside the trail. During the wild-flower season enjoy the beauty of as the forest floors come to life with amazing colours. 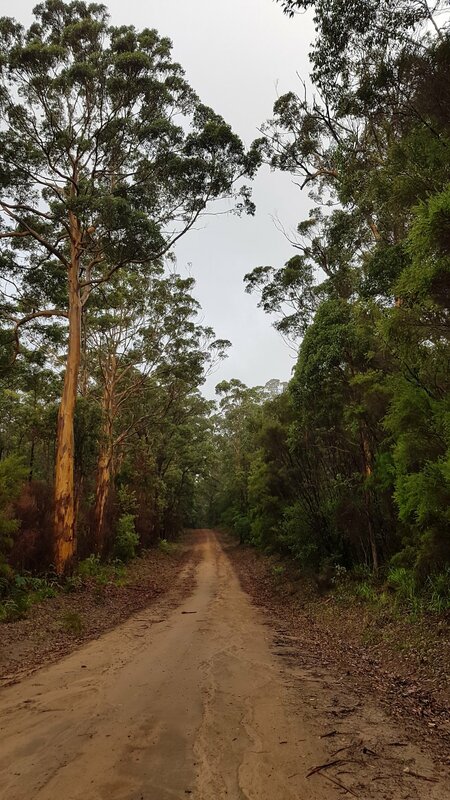 Surrounded by nature, relax and enjoy as the trail unfolds through majestic trees, such as the Karri that are the third largest in the whole of Australia. Cross the suspension bridge at picturesque One Tree Bridge, experience the splendour of the Walpole Wilderness and beautiful coastal landscapes. Finish at Albany and enjoy the comfort of a pillow top bed and a Jacuzzi to soothe those muscles. As a cycle accredited business HideAway Haven offers you the basic repair equipment and air pumps to pump up the tires. While you are here, Albany is a cycle friendly town with many cycle friendly businesses.